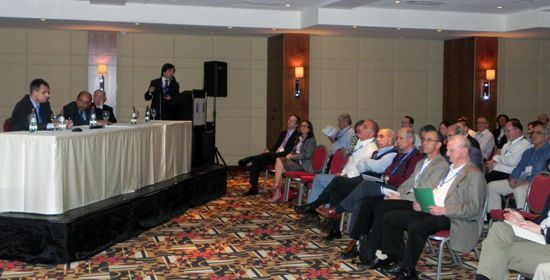 The 12th General Assembly of the European University Sport Association took place in Eilat, Israel March 3-6, 2011. 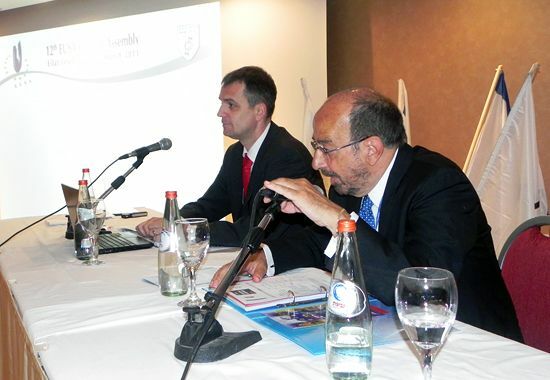 The Executive Committee of the European University Sports Association met for its first regular meeting 01-2011 in Eilat, Israel on March 3, just before the Conference and the General Assembly. 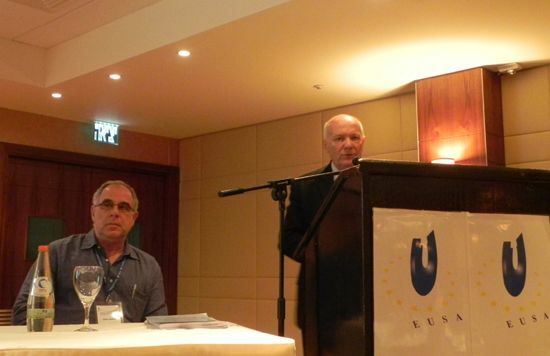 At the occasion of the 12th General Assembly of the European University Sports Association, EUSA, in cooperation with ASA Israel organised a European University Sports Conference on March 4 in Eilat, Israel. The participants and the guests were welcomed by Mr Alberto Gualtieri, EUSA President and Mr Arie Rosenzweig, ASA Israel President, with a brief introduction about EUSA Conferences and the upcoming Assembly. The floor was then first given to Mr Rifaat Chabouk, representative of the Organising Committee of the 1st European Universities Games, which are to take place in Cordoba in 2012. 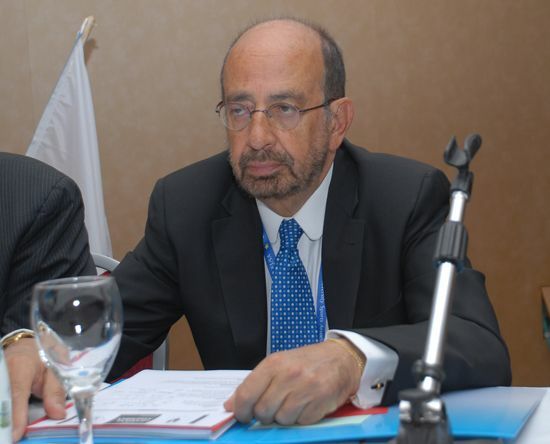 Mr Chabouk presented the concept of the games, the hosting university, sports and venues, and the general programme. A promotion video of the Games was also shown, and the launch of the official website www.eusagames2012.com was announced. Mr Rosenzweig presented the Friendship Games, with its history, idea of bringing young people together from different nationalities, religions and beliefs and through sport – basketball more specifically – establish friendships and mutual understandings and acceptance. Mrs Dana Levy and Mr Peter Birrell from Sportalise presented the new way of communicating with student athletes and at the same time managing the sports events, using the power of the modern technology to promote student sport. Mr Michael Kiritsis from Greece and Mr Arie Rosenzweig from Israel presented additional examples of good practice of championships intended mainly for the amateur non-professional student athletes in their contribution entitled FISU Experience. Mr Aitor Canibe Sanchez, EUSA Executive Committee member and Mrs Johanna St. Clair Renard, SAIF President, both also members of the EUSA Gender Equality Working Group, presented the topic of women involvement in sport. 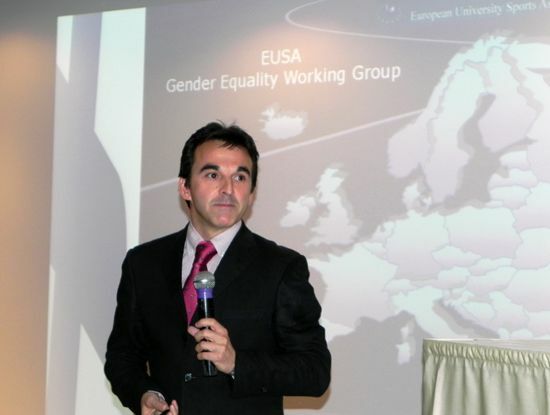 More specifically, Mr Canibe Sanchez presented the current activities of the Gender Equality Working Group and the results of the questionnaire which was distributed among EUSA member federations. Mrs St. Clair Renard presented some examples of good practises of women participation and organisation in sport, pointing out opportunities also for student sport. She concluded with an open question about the possibility of EUSA using women in sports as a catalyst for growth and development. The conference, moderated by Mr Matjaz Pecovnik, EUSA Secretary General, was attended by the delegates and representatives of EUSA member federations, with invited guests also from FISU and Continental Organisations. We can especially point out the presence of Mr George Killian, FISU President, Mr Eric Saintrond, FISU Secretary General, Mr Ralethe Malumbethe, FASU President, and several FISU Executive Committee members, as well as other guests from Israel and abroad. 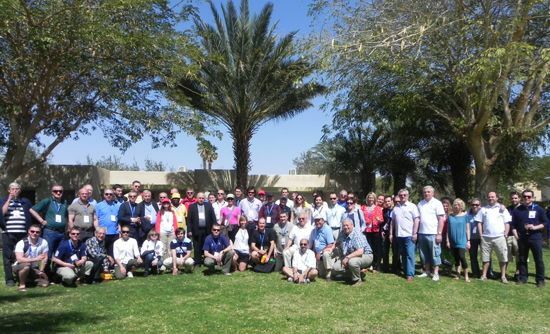 The participants also enjoyed a sightseeing tour of Eilat and the vicinity, with a special tour of kibbutz (a special agricultural community) Eilot, the southernmost kibbutz in the world, and a visit to the nearby Jordanian and Egyptian borders. In the evening, the hosts also organised a party on the beach, completed with an entertainment programme. 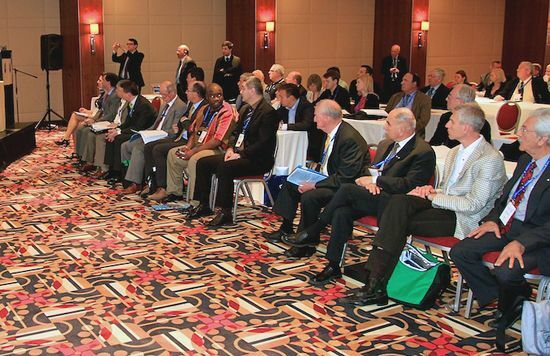 At the General Assembly, representatives of 36 members - national university sport associations were present. Apart from the delegates and official representatives, the Assembly was also attended by the highest representatives of university sport with guests from the International University Sports Federation (FISU) and the Federation of African University Sports (FASU), representatives from the national and local authorities, university rectors and other distinguished guests. 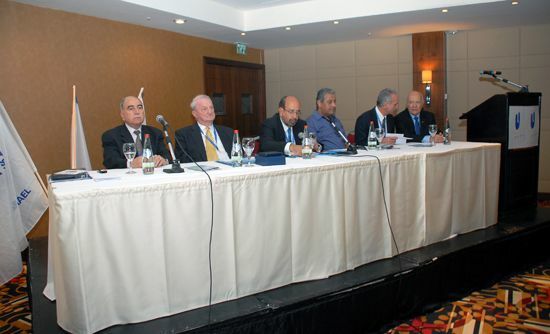 During the Opening session, the introductory speeches were given by Mr Meir Izahak Halevi, the Mayor of Eilat, Mr Uri Sheffer, the Head of Israel Sports Authority, Mr Mansour Abu Rashid, high general from Jordan and Mr George Killian, the President of FISU. The guest speakers were welcomed by Mr Arie Rosenzweig, President of ASA Israel and Mr Alberto Gualtieri, President of EUSA. Mr Gualtieri also expressed his gratefulness to the representatives of the member countries for participating in the assembly and thanked the delegates and the guests for their presence and contributions at the Assembly and throughout the year. After the opening part, the Assembly confirmed Mr Gualtieri as the Chair of the Assembly, as proposed by the EUSA Executive Committee. The Agenda and the minutes of the previous Assembly were approved, followed by the Annual Reports. 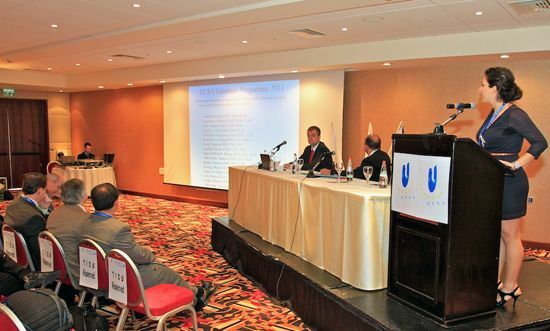 Mr Gualtieri presented the report of EUSA activity in 2010 on behalf of the Executive Committee. As the President of EUSA he also took this opportunity to thank the main partners and sponsors – FISU and Asiana Airlines – which are financially supporting EUSA, enabling it to grow and provide quality services and events to the member federations, Universities and students across Europe. Mr Matjaz Pecovnik, EUSA Secretary General presented the report on the past European Universities Championships, accompanied by statistics and data also depicting the participation of women in EUSA events. 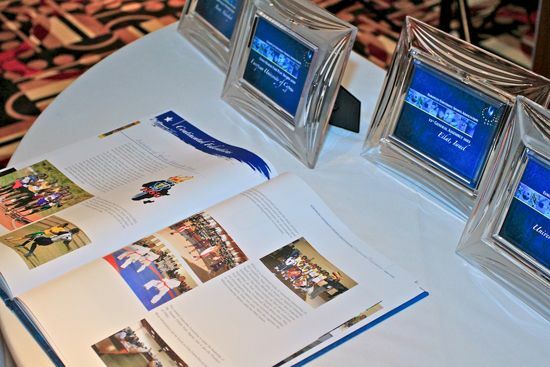 EUSA Student Commission Chairwoman, Ms Eleftheria Kallikazarou gave a report on the activities of the STC in the previous year, with emphasis on the Volunteer Programme and the Photo Competition Award. As Ms Kallikazarou’s mandate in STC has finished with this Assembly, EUSA President especially thanked her for the work carried out during her term. Due to the changes of the physical year of EUSA, adopted at the Assembly in 2009, the Financial report with Annual accounts were given for the years 2009 and 2010 by EUSA Treasurer Mr Leonz Eder. 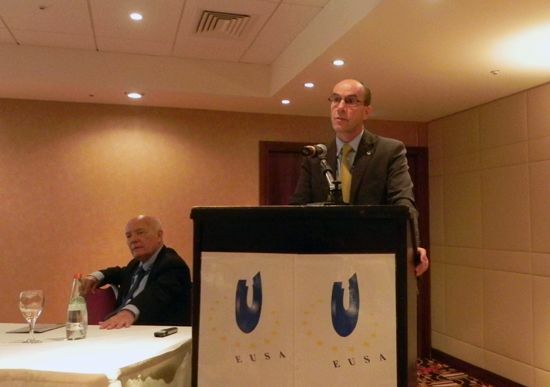 Mr Eder presented the incomes and expenditures of EUSA during the last two years, emphasising the sound and stable operations. The Auditors, Mr Jakub Kosowski from Poland and Mr Zrinko Custonja from Croatia gave a report of the extensive review of EUSA during these two years, and proposed the Assembly to approve the reports, which were then also accepted. As every year, EUSA attributed awards for best achievement of the past year, inviting all recipients to the Assembly. The Best University Award for 2010 was given to the University of Coimbra from Portugal for the highest participation in the European Universities Championships in the previous year. 11 teams participated in EUSA events, and their students also won titles of champions in two sports. 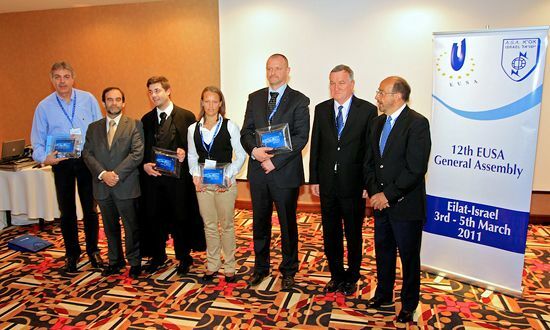 The Enno Harms Fair Play Award was attributed to the Men’s Handball Team of the European University of Cyprus. The team decided not to use advantage in players’ numbers due to the injuries of the opponent team, playing the game with the same number of players, showing the true spirit of sport and fair play. The award for the Most Active NUSA was received by the Polish University Sport Association (AZS) which sent 27 teams to the European Universities Championships in 2010, altogether with 389 participants. They organised three European Universities Championships, and their students won 3 championships titles. Finally, Ms Beate Alderslyst from Norway was awarded for the Photo Competition as the winning photo, chosen by the Student Commission, depicts the joy of competing and being a part of the enthusiastic family of European University Sports. 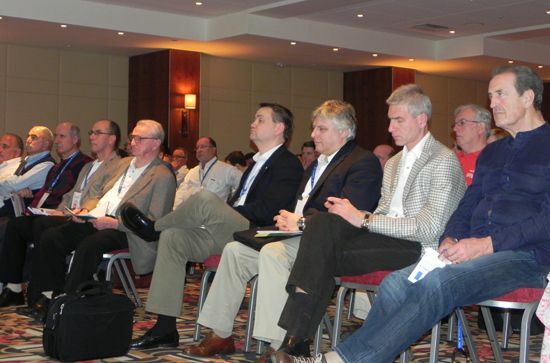 EUSA Assembly confirmed the modifications of the Statutes as proposed by the Norwegian federation regarding the delivery of the Assembly documents. An interesting discussion followed about the inclusion of students in the EUSA Executive Committee as a result of another proposal of statutes modification. During the discussion, the latter motion was withdrawn, and its concept and intention was added to the Activity Plan of EUSA for the current year. 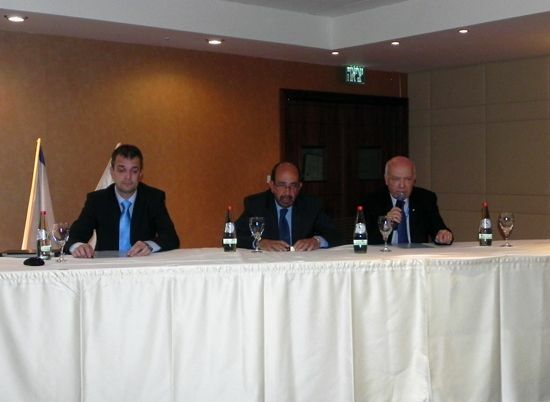 EUSA President Mr Gualtieri, Secretary General Mr Pecovnik and Treasurer Mr Eder presented the Activity Programme and Provisional Budget for 2011. Among the topics we can highlight the continuation of providing help to less active NUSAs, preparations for the European Universities Games, a record number of European Universities Championships (16) to be organised in 2011, all following a fairly conservative budget, ensuring the stability of the organisation. After discussion of the Programme and the Budget, both were approved by the Assembly, with some amendments as the result of the debates. The Assembly concluded by the presentation of the EUSA Assembly 2012 by Mr Otmar Kugovnik, EUSA EC member and the President of the Slovenian University Sports Association. He invited all the delegates and the guests to come to Maribor in March 2012 for the next EUSA Assembly, and as Maribor is the venue of the next Winter Universiade, Mr Kugovnik also expressed his hope to welcome all EUSA member federations there. At the end, EUSA President Mr Gualtieri thanked Mr Arie Rosenzweig for hosting the Assembly, and presented him with a symbolic memorial plaque to commemorate the event. 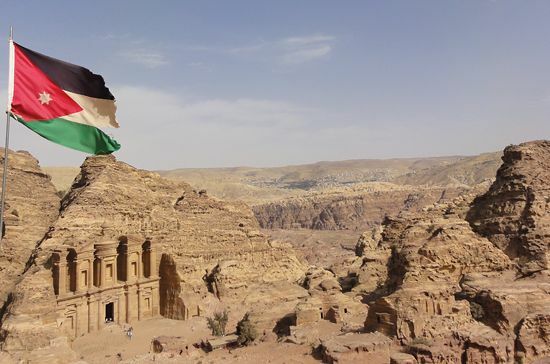 The participants were invited to an entertainment programme in the evening, followed by an optional tour to Petra, Jordan the following day.